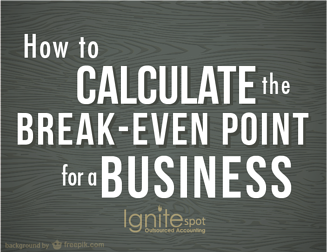 A few months ago we published a short video demonstrating how to calculate your company's break-even point. It quickly became one of our most popular articles because A) it was a super helpful video and B) the break-even equation can be a little confusing for entrepreneurs. We're visiting this equation again because every business owner needs to know the minimum revenue they need to generate in order to stay in business (AKA the break-even). We hope you find this Slideshare helpful. First, what is the break-even point? For those unfamiliar with this term, it's critical to your business that you learn it fast. The break-even point is the amount of sales you need to generate just to produce a profit of zero. In other words, it's the amount you need to make in order to keep your doors open and stay in business. Have more basic accounting questions? Be sure to check out our accounting resource center. Next, you need to know all of your overhead costs. These are necessary costs for your business that you must pay monthly regardless of any sales being made. Examples of overhead costs are: rent, insurance, and payroll. Once you've gathered and calculated your total overhead costs, you need to tally up your balance sheet payments. These are payments that aren't necessarily classified as an accounting expense, such as: principal loan payments, stakeholder payments, and owner draws. You have calculated your gross margin to be 89%, your overhead expense is $25,000, and your balance sheet payments equal $7,000. Now all you have to do is plug your numbers into the break-even equation. Your break-even point is $35,955. That means in order for your business to stay in operation, you must generate a revenue of $35,955. Anything above this number is considered profit. You obviously want to be more profitable than the bare minimum though. If you're interested in taking your profitability to the next step, sign up for our free email course: 30 Days to a Profitable Business, by clicking the purple box below.